A monthly communication to the faculty, residents, staff, and friends of the University of Michigan Urology Family. 1. Academic medicine revolves around a lovely cycle. This cycle is distinct from a fiscal cycle that is generally not so pleasant, although the two are keenly intertwined. The financial margin of clinical care has supported the academic cycle for the past century if not longer. Some health systems have been managed so well that they provide large and even huge financial margins that can be reinvested in the academic mission although that has not been a big part of our history in Ann Arbor. Those large margins are under attack from some, such as Charles Grassley in the Senate, who rightfully question the “not-for-profit” status of organizations with multimillion dollar CEO salaries plus bonuses, corporate jets, and all the other accoutrements of the “for profit” world. While the “for profit” sector normally pays taxes, the social good of not-for-profit businesses is the justification for sparing them routine taxation. On the other hand, those “normal” taxation responsibilities are regularly evaded by the corporate world via legal loopholes cleverly placed by self-interested legislators and lobbyists. As Captain Renault, played by Claude Rains in the film Casablanca, said with great irony: “I’m shocked, shocked to find that gambling is going on in here!” (as a casino worker walks up to the captain with a wad of money and says: “Your winnings sir.”). Anyway, the world is changing and new fiscal reality threatens academic medicine. 2. A recent Wall Street Journal article exposed the large mark up of expensive drugs purchased at discount by some educational institutions. This has been one way some institutions have been able to achieve those grand margins at the end of the fiscal year. The Time magazine single-issue-exposé by Steven Brill this past February, tells this story well and in great detail. We at Michigan have not been so clever, perhaps even to a fault if you look at our meager margins, but that is another story, for another day. 4. This year the White Coat Ceremony was held Sunday, August 4 in Hill Auditorium. This and Graduation are the bookends of the medical school experience and they are wonderful events – well worth experiencing or re-experiencing from time to time even if you are a seasoned physician or anyone else in the Michigan Urology Family. Family, in fact, was much of the theme of the White Coat Ceremony. Most if not all entering students had family members present who often vigorously cheered as their son or daughter announced his or her name, hometown, and college. The student then crossed the stage where the Dean helped them put on a white coat and faculty members presented each one a stethoscope. Dean Jim Woolliscroft talked about enlarging importance of “The Team” in health care, echoing Bo Schembechler’s cry for “The team, the team, the team!” President of the Medical Center Alumni Society (MCAS), Bob Evani (UMMS MD 1986) also talked of “family” – emphasizing the family of this particular class of 2017 and the family of MCAS. Michigan Urology with its Nesbit Society is our specialty team, a form of the team that we understand especially well in Ann Arbor. 5. MCAS. One unusual and excellent thing that we have here at Michigan is the Medical Center Alumni Society. Whereas in most other medical schools the alumni are considered graduates of the medical school specifically, here at Michigan MCAS embraces the residency graduates equally and vigorously. This makes great sense in that we have somewhere around 700 medical students at a time and well over 1000 residents simultaneously. Furthermore, the medical students are here for usually 4 years, but residents average more than that time, many are here twice as long or longer. This has been one way that the University of Michigan, in aggregate, can probably boast the largest and most active university alumni in the world. 6. Labor Day, a U.S. federal holiday since 1894, celebrates workers. The triggering event for the unanimous vote by Congress to institute Labor Day was the wildcat Pullman Strike. The massive boycott that grew affected most rail lines west of Detroit and led to sabotage, riots, $80 million in property damage, and at least 30 deaths largely at the hands of military troops and U.S. Marshals. President Grover Cleveland, who had stepped in earlier to end the strike and called in the federal troops when an injunction to cease the strike was ignored, signed the holiday into law just 6 days after the strike ended. Labor Day this past Monday 119 years after its inception was a nice break from clinic for me and is for all of us a pleasant way to mark the end of summer and prepare for the more frenetic days of fall. 7. Football season. With autumn comes thoughts of the Big House. An excellent season is forecast. This is relevant to us at Michigan Urology for a number of good reasons. First, Wolverine Football is a central feature of the fall environment in Ann Arbor. It brings pride to our community, our students, our faculty, and our alumni. Pride in one part of our university extends to all parts – each unit wants to be equally successful in its own game. Football is a feature of our alumni reunions (the Nesbit Reunion in particular). For some reason a successful football season seems to boost applications to most of our schools and colleges (I’m not a sociologist, so I offer no explanation). Sports educate us. We see how a genuine sense of “The team, the team, the team” (Bo Schembechler’s enduring quote once again) enhances performance far better than any drug or phony slogan. Urology recruiting. 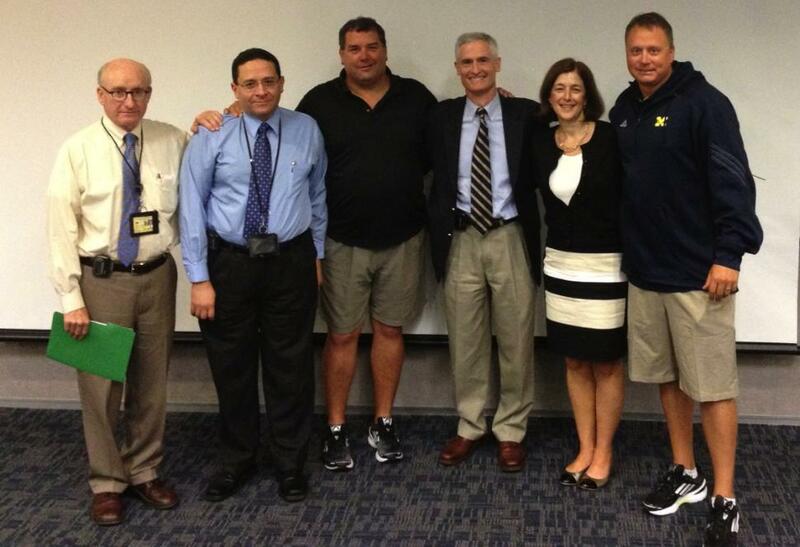 Last month Gary Faerber (Associate Chair, Education), Khaled Hafez (Residency Program Director), Kathy Cooney (HemOnc Division Head and Urology Joint Faculty) and I spent a morning with Brady Hoke (UM Football Coach), Jeff Hecklinski (Wide Receivers Coach and Recruiting Coordinator), and Chris Singletary (Director of Player Personnel) to learn about their amazing work as our own residency recruiting season is about to heat up. Coach Hoke has built up a superb team with a very sophisticated recruiting system and a genuine approach to team development. They gave us nearly an entire morning of play-by-play instructions leaving us energized for our next campaign to recruit our Urology Class of 2019. Michigan Urology will be 100 years old then by the time this next class graduates, by my reckoning (looking at the arrival of Hugh Cabot in 1919), and Michigan Football will be 140 years old then, looking at 1879 as the start of Wolverines Football competition. Michigan joined the Big Ten at its inception when it was known as the Western Conference in 1896. The Wolverines have had the most all-time wins and the highest winning percentage in college football history. Michigan Football coaches have been Fielding Yost, Harry Kipke, Fritz Crisler, Bennie Oosterbann, Pete Elliott, Bo Schembechler, Gary Moeller, Lloyd Carr, Rich Rodriguez, and now Brady Hoke. 9. Coach Hoke is very big on the study and celebration of history, something that may have slipped a bit in the preceding coaching regime. Schembechler Hall, now in the midst of serious renovation, is a living testimony to the rich and inspiring tradition of Michigan Football. Of course I can’t mention Coach Bump Elliott without recalling his brother Pete, another great Big Ten football coach and the father of my good friend Bruce Elliott, a local attorney and premier girl’s field hockey coach. Both Bump and Pete were great UM athletes. Pete was an All-American quarterback on the undefeated 1948 Michigan football team that won a national championship. He is the only Michigan athlete in history to have earned 12 letters in varsity sports (football, basketball, and golf). After his own great coaching career, he served as the Executive Director of the Football Hall of Fame, in Canton, Ohio, where he died earlier this year at age 86. (Picture with brother Bump Elliott on the right). Pete was not just an extraordinary athlete, coach, and teacher, but he was simultaneously a true gentleman in the highest sense of the word. 10. Last month Dean Woolliscroft held a ceremony for Bill Smith who stepped down as chair of Biological Chemistry. It seems like yesterday since Bill returned to Ann Arbor as chair, hired then by Dean Lichter. Bill has been a great chair and happily will be remaining on the faculty to do his work as professor, which he does so well. One of the things he said in his remarks that struck me in this day of clinical trials, health services research, and disease-focused research programs was: “Let’s not forsake curiosity-driven science.” An astute comment from another true gentleman. David Engelke is Bill’s worthy successor as chair. 11. 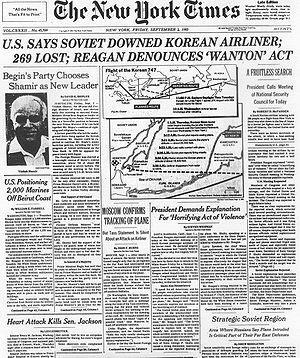 In one of the tensest times of the Cold War, thirty years ago, around this time (actually Sept 1, 1983), military pilots of the Soviet Union shot down a commercial Korean Air Flight KAL-007 on the way to Seoul, Korea. The USSR stated that the pilots did not recognize KAL-007 was a civilian aircraft when it apparently violated Soviet airspace. Of course, conspiracy theorists have proposed alternative explanations, although I’ve come to realize that as a human endeavor military incompetence is more likely than competent conspiracy. 12. On that flight was US Congressman Lawrence McDonald. Former President Richard Nixon was supposed to have been on that flight as well, assigned a seat next to McDonald, but must have decided near the last moment not to attend the 30-year anniversary ceremonies of the U.S. – Korea Mutual Defense Treaty. Senator Jesse Helms of North Carolina, Senator Steven Symms of Idaho, and Representative Carroll J. Hubbard, Jr. of Kentucky were aboard sister flight KAL 015, which flew 15 minutes behind KAL 007. McDonald was an ardent anticommunist and one conspiracy theory had it that the flight was shot down to kill this vocal senator. 13. McDonald was born and raised in Atlanta. His father Harold McDonald, Sr. was a prominent urologist. Larry studied history at Davidson College, medicine at Emory (MD 1957) and had a year or two of surgery at Grady Memorial Hospital followed by two years in the Navy. As a flight surgeon stationed in Iceland he met and married an Icelandic national. While in Iceland he developed a keen concern about communism that would define much of the rest of his life. 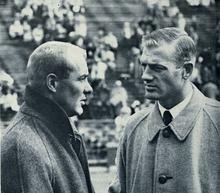 He came to Michigan to train under Reed Nesbit in Urology, following his older brother Harold McDonald, Jr. Their father, a friend of Reed Nesbit, undoubtedly encouraged the Ann Arbor training due to his regard for Nesbit and the reputation of the program. 14. Larry’s anxiety over the influence of communism had led him to join the John Birch Society and he became a leader of the organization in SE Michigan. Fellow residents recall that hospital rounds often became “political rounds” and McDonald was known to attend political night meetings throughout the region, sometimes returning home in the early morning hours just in time to get to the operating room. He finished residency in 1966 and returned to Atlanta to practice in the McDonald Clinic. He is recalled as having been a strong advocate of the compound laetrile as an anti-cancer agent. McDonald’s passionate preoccupation with politics was said to be a factor in divorce from his wife. He made one unsuccessful run for Congress in 1972 before being elected in 1974. In 1975, he married Kathryn Jackson, whom he met while giving a speech in California. In 1974, McDonald ran for Congress against incumbent John W. Davis in the Democratic primary as a conservative who was opposed to mandatory federal school integration programs. McDonald won the primary in a surprise upset and was elected in November 1974 to the 94th United States Congress. Interesting how things change – he was an ardent Democrat. 15. 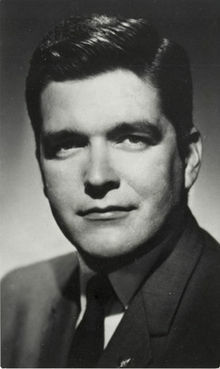 Harold McDonald, Larry’s older brother, finished training under Nesbit in 1963. Roy Correa (Nesbit ’65) recalls Harold as a “type A extrovert” as well as a clinical innovator and excellent bridge player. Harold incurred Nesbit’s wrath when he fell behind 250 operative report dictations, but must have completed that work well enough to regain the good graces of “the Boss” and obtain an academic job at New York Down State Medical Center in Brooklyn as an assistant professor. Ultimately, he returned to Atlanta to practice with his father and brother at the McDonald Clinic. He died of a stroke while playing golf in California. Thanks to Roy Correa, Betty Konnak, and David Skeel for help putting together these recollections. I noted there is a Wikipedia page for Larry McDonald, but not for Reed Nesbit. This needs to be corrected! Volunteers? 16. Roy Correa offered me some more interesting Michigan Urology history during our communications about the McDonalds. “Not sure if you got my first reply relating to Larry and Harold McDonald. I am at our vacation house and writing on an old computer… The thing I left out was the air crash that killed John Wear [the Chicago crash – American Airlines flight 191 May 25, 1979]. John was a resident three years ahead of me along with Bruce Stewart and Barry Breakey. They were a great trio (Nesbit class of ’61). John was the son of the Urology department chairman at the University of Wisconsin. His death was a real tragedy as was Bruce’s premature death to prostate cancer; don’t tell me that we should not screen for CAP, probably the best pair of urologists in the country died from it (Stewart / Straffon – ‘59). 18. Even so, the aircraft (DC-10) was designed to withstand the loss of an engine and Flight 191 should have been able to return to the air field on its two remaining engines. Wikipedia tells us that “Unlike other aircraft designs, however, the DC-10 did not include a separate mechanism to lock the extended leading edge slats in place, relying instead solely on the hydraulic pressure within the system. In response to the accident, slat relief valves were mandated to prevent slat retraction in case of hydraulic line damage. Wind tunnel and flight simulator tests were conducted to help to understand the trajectory of flight 191 after the engine detached and the left wing slats retracted. Those tests established that the damage to the wing’s leading edge and retraction of the slats increased the stall speed of the left wing from 124 knots to 159 knots. The DC-10 incorporates two warning devices which might have alerted the pilots to the impending stall: the slat disagreement warning light, which should have illuminated after the uncommanded retraction of the slats, and the stick shaker on the captain’s control column, which activates close to the stall speed.” (The stick shaker has come into recent attention due to the failed landing in San Francisco this summer.) In the Chicago tragedy (AA Flight 191) of 1979, however, both of these warning devices were powered by an electric generator driven by the number one engine. Accordingly, both systems became inoperative after the loss of that engine. 19. Belts and suspenders. The first officer’s control column was not equipped with a stick shaker at the time of the Chicago crash, although that alone probably would not have made a difference then as stick shakers were powered from that number one engine. (The stick shaker device was offered by McDonnell Douglas as an option for the first officer, but American Airlines chose not to have it installed on its DC-10 fleet. Stick shakers for both pilots have since became mandatory in response to this accident.) With these issues we see an essential interplay between industry and regulation. The proportional balance is a matter of constant arbitrage. On one hand in the airline industry the dual stick shaker mandate is probably a public good, with little downside, yet on the other hand in health care the EHR legislation and ironic “meaningful use” constraints (perhaps well-intended) have been premature (the law implementation preceded mature EHR products) and have increased costs and decreased safety from my perspective so far. 20. The physician is custodian to the human condition. No checklist, set of duty hours, electronic medical record, or set of regulations or systems can alleviate that prime professional responsibility. a.) James E. Montie Visiting Professorship: Friday, September 20 from 3:30-5:30 pm, CVC Danto Auditorium. This year’s Visiting Professor is W. Marston Linehan, MD, Chief of Urologic Oncology Surgery and the Urologic Oncology Branch at the National Cancer Institute in Bethesda, Maryland. b.) Reed M. Nesbit Urologic Society & Visiting Professor Meeting: Thursday, October 17 – Saturday, October 19, 2013. Attached is a copy of the meeting schedule. A great program has been planned and this year’s Visiting Professor is Raymond Costabile, MD, Senior Associate Dean for Clinical Strategy, Jay Y. Gillenwater Professor of Urology and Vice Chairman at the University of Virginia. We are hoping to see many alumni at this event in which we will be recognizing those who completed their training in 2003, 1993, 1983, etc. For more information and to register contact Sandra Heskett by phone at 734-232-4943 or by email at sheskett@umich.edu. 22. Last month our internal weekly “What’s New” profiled Julian Wan (Reed Nesbit Professor of Urology, Pediatric Urology Division), Stuart Wolf (David A. Bloom Professor of Urology, Associate Chair for Surgical Urologic Services, Chief, Endourology Division), John Hollingsworth (Assistant Professor, Endourology Division and Health Services Research) and an update from two new joint faculty members Jonathan Dillman (Assistant Professor, Radiology and Urology) and Hal Morgenstern (Professor, Epidemiology, Environmental Health Sciences, and Urology). Website: http://www.med.umich.edu/urology/about/MonthlyNewsletter.html. Best wishes, and thanks for spending time on “What’s New” this weekend.